Maples usually don’t mind wet feet, but the roots of this twin-trunk beauty—spotted along the Wisconsin bank of the St. Croix River—tell a different story. Like an elderly couple, one’s frail arm wrapped tenderly around the other, they seem to have turned their backs to the water, struggling to escape up the bank. Decades of repeated flood and drought, freeze and thaw, waves and current have clawed at the tree’s footing. Storm gusts, funneled up the valley along open water, seize its leafy crown, twisting, levering at the old couple’s tenuous grip on wet, sandy ground. peer out of the shadows. To the generous eye, those gnarly roots reveal the extent of the torment. Like twisted arms and legs, they reach and strain. Among them, anguished faces peer out of the shadows. How many more storms and floods will this denizen of forest's edge abide? 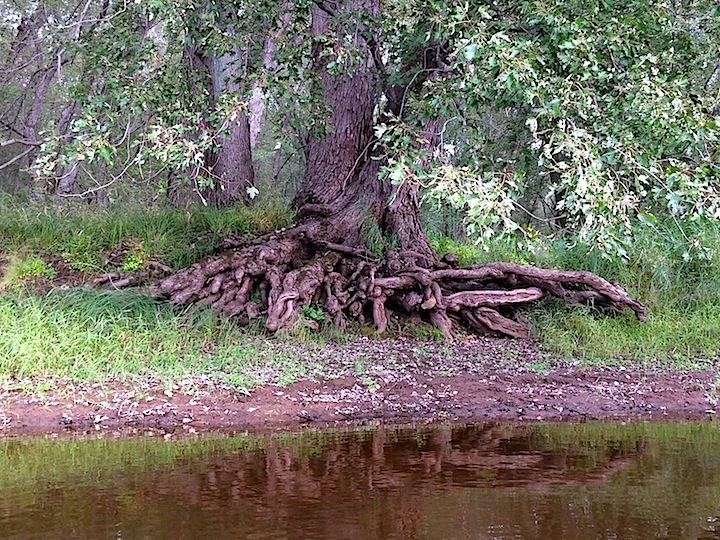 Will it be these battle-worn roots that first give way…or will they hold while aging trunks snap? I'm struck by the parallel to the human condition, to how we of warmer flesh and blood bear life's torments and burdens, and persevere. How those who best survive are those able to put down more roots, deeper roots. For, tormenting as those challenges may be, they are the very legs we stand on. Thanks for the kind words, Jean. I wouldn't presume to call myself a poet, but I do try to craft the words to be evocative and read well.